You can’t really go wrong when you’ve got a talent for tunes and a thoroughly eclectic approach to lyrical content. 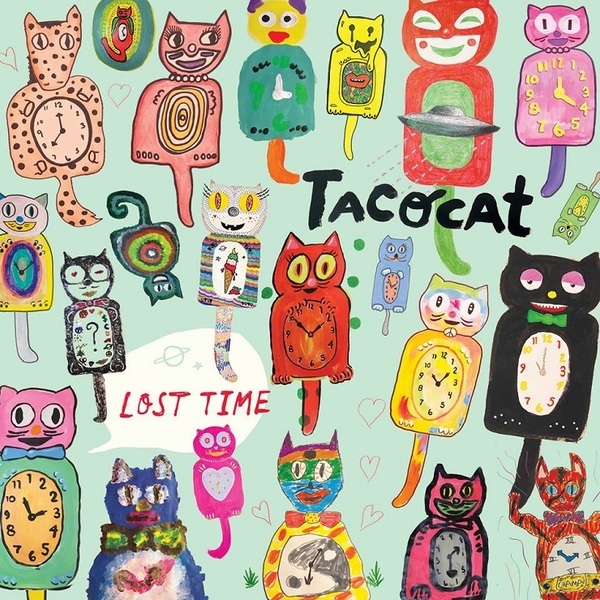 For Seattle foursome Tacocat, this has resulted in a catalogue of songs with engaging hooks and a sharp line in wit. Embracing the surf-punk style that’s been a staple component of the indie scene in the US for many years, Tacocat emerged back in 2007 and have since won over a solid fanbase on the back of tunes such as ‘Crimson Wave’ (a slice of pop perfection about ‘that time of the month’, which also formed part of some controversy when Katy Perry was accused of nicking her dancing sharks from the video concept). ‘Crimson Wave’ featured on Tacocat’s brilliant 2014 album NVM, a fine selection of bubblegum pop which also featured the super-surf appeal of ‘Bridge to Hawaii’ and the raw energy of ‘Hey Girl’. Now with new album Lost Time, the band have served up another solid collection of songs full of catchy melodies and a simple, stripped down appeal. Take opening track ‘Dana Katherine Scully’, whose plucky guitar tune serves as a tribute to The X Files finest. Scully’s unflappable character is finely summed up with lines like “coz she’s the only one thinking it through/she’s got the shoulder pads no nonsense attitude”. Elsewhere, the more muscular ‘FDP’ is a brief percussive number, which gives way to the apocalyptic glory of ‘I Love Seattle’, whose garage guitar sound and doo-wop vocal trills will get your feet tapping as soon as it kicks off. In terms of style and sound, Tacocat arrive somewhere between Talulah Gosh and The B52s, although being from Seattle there’s also something of a nod to Nirvana’s legacy. There’s more than a fair share of riot grrrl in the mix too. Consisting of Lelah Maupin (drums), Eric Randall (guitar), Bree McKenna (bass) and Emily Nokes (vocals), Tacocat deliver a pop party of melodic goodness. They also landed the theme tune for the rebooted Powerpuff Girls earlier this year with the grungy guitar-pop of ‘Who’s Got The Power’. There’s also some timely feminist themes in much of their output, often delivered in a wry manner by way of buzzy songs such as ‘Men Explain Things To Me’ – a satirical musing on the concept of ‘Mansplaining’. The band also find time to add in some topical commentary on Lost Time as well. Consider ‘The Internet’ which is a dry slice of percussive pop whose lyrics rotate around the rising trend for anonymous voices giving vent to the worst thoughts through the interwebs. “Your place is so low/human mosquito” sings Nokes in a song that’s melodic yet also a dryly delivered slice of observation. ‘Night Swimming’ is another shimmering wonder about illicit lake swimming with a witty line stating “You can bring a boombox/but you can’t play R.E.M.” Meanwhile, album closer ‘Leisure Bees’ appears to have more than a nod to 60s girl bands with its hand-clapping chorus and analogies to working being like in a hive. “Wearing your pyjamas ’till the end of time” is just yet another smart lyric that’s one of many peppering the tracks of Lost Time. As a brief respite from the seriousness that usually emanates from the indie rock scene, you could do worse than take a seaside trip with Lost Time giving your ears their own mini party. Lost Time on the Hardly Art label is out now.